Riyadh: Saudi Arabia on Tuesday suspended the Binladin Group from taking new projects following a deadly crane collapse in Makkah’s mosque. The Binladin Group is one of the biggest construction companies in the kingdom and is the developer for an expansion project at the Grand Mosque. The Saudi Royal Court has ordered the Finance Ministry to review all of Binladin Group’s projects. 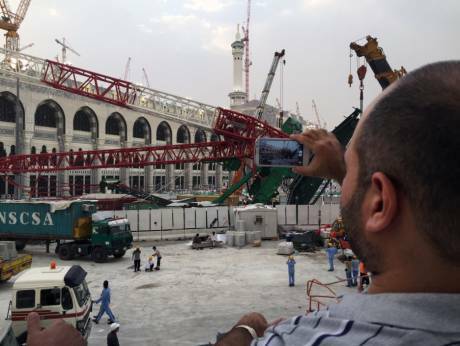 At least 107 people were killed when a crane collapsed at the Grand Mosque on Friday. More than 200 people were also injured when the crane crashed into a courtyard. Indonesian and Indian pilgrims were among those killed when the crane collapsed, while the injured included Malaysians, Egyptians, Iranians, Turks, Afghans and Pakistanis. Hundreds of thousands of pilgrims had already arrived in Makkah when the massive red and white crane toppled over during a thunderstorm on Friday. The cranes soar skywards over the sprawling expansion taking place beneath the Makkah Royal Clock Tower, the world’s third tallest building. For years, work has been under way on a 400,000-square-metre enlargement of the Grand Mosque to allow it to accommodate up to 2.2 million people at once. An engineer for the Saudi Binladin Group on Saturday told AFP the crane had been installed in “an extremely professional way” and that there had been no technical problem. Saudi king Salman Bin Abdul Aziz has vowed to find out what caused the tragedy, and said that investigation results will be made public. “We will investigate all the reasons and afterwards declare the results to the citizens,” King Salman said after visiting the site, one of Islam’s holiest.